Not too terribly long ago, I worked as the in-house content marketer at successful Silicon Beach startup Solid Commerce. I brought Solid Commerce an inbound site traffic and lead generation increase of about 100% compared to their growth over the previous five-year period. It was a blast. 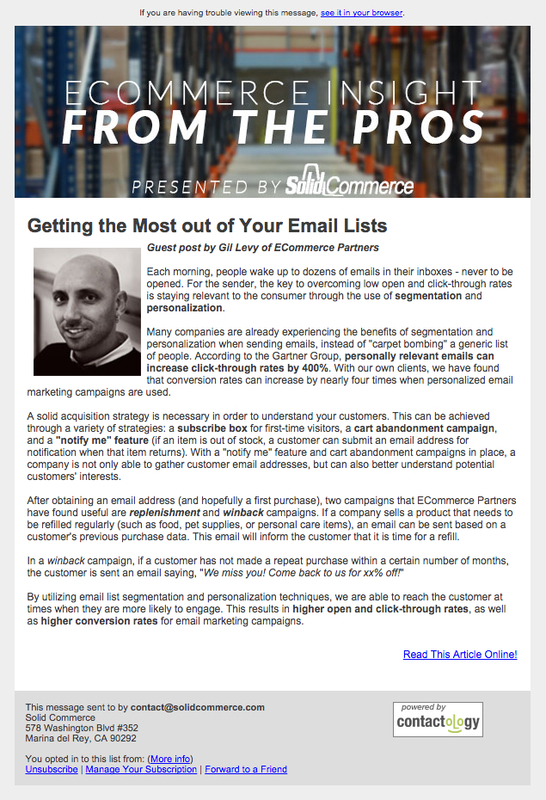 Email was a huge part of these efforts: working closely with the VP of Marketing, I developed and executed an all-new email campaign for Solid Commerce, giving them a bit of a design update and creating/curating more engaging content for their customers, leads, and industry connections. My work helped Solid Commerce double the size of their email list, and my campaigns regularly saw open rates between 25% and 35% — well above industry benchmarks. Check out a couple samples of my work, if you you'd like! I executed all copywriting and graphic design, the latter of which was part of a concentrated effort to update the Solid Commerce brand from a design standpoint. Another client of mine, Patrick Cain Designs, utilizes email to engage its audience and stay connected with his social community. As a local designer, live appearances and person-to-person connections are a big part of Patrick Cain's list-building strategies. By curating and creating content focused on design, fashion, architecture, and culture, we've used email marketing to keep Patrick's online community and potential sales leads engaged with the PCD brand and its products. The Patrick Cain Designs community is a highly-engaged one — my email campaigns for PCD also routinely see open rates of 30% and above. And hey! Why not? 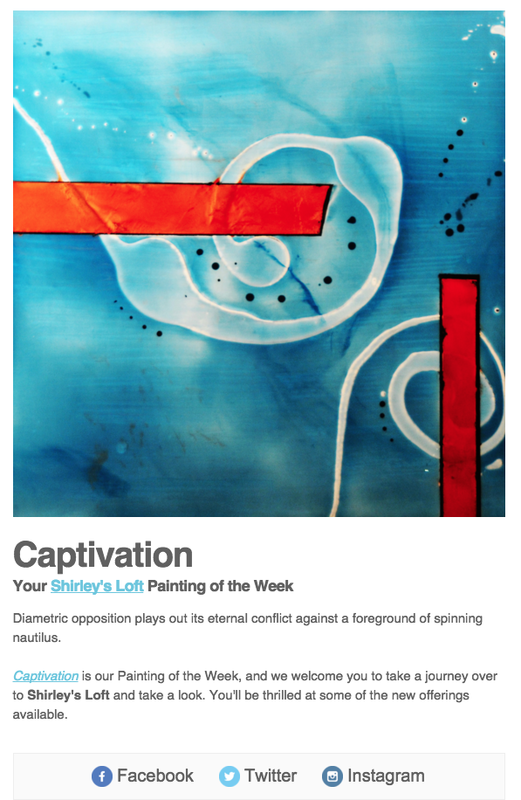 Here's another sample: this one comes from a limited campaign I did, as well as an automated email workflow I set up for the wonderful Shirley's Loft (whose website I also created — if you like good, independent art, you should absolutely give her work a look).